This two-storey Gate House has a crenellated top and is a scheduled ancient monument. It dates from the late 15th century. Porthmawr is Welsh for “large gate”. Originally the Gate House protected the fortified manor house of Cwrt-y-Carw (“Stag’s Court”), part of the defences of the English Lordship of Raglan. It was once home to a branch of the powerful Herbert family. You can view the stone effigies of Sir John Herbert (d.1666) and his wife in St Edmund’s Church. The manor house was one of the first buildings in Wales to be demolished to make way for a bypass road, when New Road was constructed in the early 19th century to relieve the town centre of traffic between today’s A40 and Crickhowell Bridge. The manor house was replaced in the 1820s by a Regency mansion, named Porthmawr, which you can read about on this page. 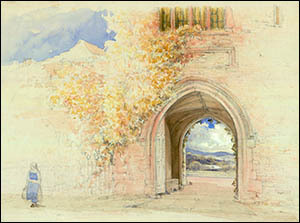 Around the same time, the Gate House was renovated and embellished with a vaulted ceiling to its archway – visible in the Victorian watercolour (above right) by Caleb Robert Stanley. A drawing of the Gate House appeared on banknotes issued in Crickhowell. 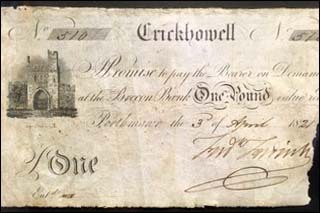 The text on the example shown here, courtesy of Crickhowell Archive Centre, reads: “I Promise to pay the Bearer on Demand at the Brecon Bank One Pound value rec’d Porthmawr the 3 of April 1821.” The Brecon Bank operated from 1778 to 1890, when it became part of Lloyds Bank. Initially these early banks catered for farmers and drovers, enabling them to travel through outlaw-infested countryside without cash. Extensive renovation of the whole Porthmawr site began in 1998. The Gate House was limewashed to preserve the natural stonework, with the approval of Cadw and the Brecon Beacons National Park Authority. The yellow colour was matched to the limewash applied centuries ago to this and other stone buildings. The colour was something of a shock to local residents who had grown up seeing the Gate House as a bare stone structure! There were many letters and articles, for and against the limewash, in the local newspapers.